One of only 5 lots that front on Palm Circle W., going through to 3rd St. – MHK Architecture, built by Waterside Builders and brought to perfection by professional interior designer. This home was featured in Home and Design Magazine exemplifying Coastal Modernism. The meticulous attention to detail is evident & the large parcel allows for spacious indoor & outdoor living areas with 16-foot ceilings in the living room with clerestory windows, a tumbled onyx fireplace, an open floor plan with the adjoining dining room and U shaped kitchen plus a large butler’s pantry/bar area. French Oak floors, Andersen windows, high-end appliances, quartz countertops are just a few of the features. 1st floor Master bedroom, 2 additional 1st-floor en-suite guest bedrooms (one is currently used as a den) with 2 guest bedrooms upstairs with loft area & sunset balcony. 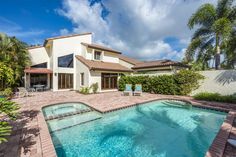 An expansive outdoor area with saltwater pool & spa, summer kitchen, outdoor fireplace, pool bath & travertine deck. 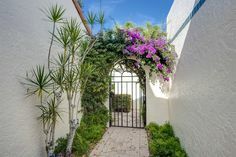 Located just 3 blocks to the beach and close to 5th Ave, this tropical setting blends harmoniously with nature, creating a livable and relaxed environment.